The island is often referred to as the Island of Hawaiʻi,  the Big Island, or Hawaiʻi Island to distinguish it from the state. 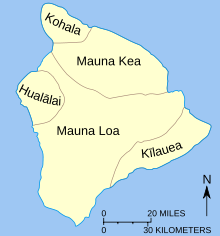 Administratively, the whole island encompasses Hawaiʻi County. A view of the Kohala Coast and adjacent volcanoes, taken from the slopes of Kohala Mountains about 6 miles (10 km) northwest of Kawaihae. From left to right: Mauna Kea, Mauna Loa, and Hualalai. Steam plume as Kīlauea red lava enters the ocean at three Waikupanaha and one Ki lava ocean entries. Some surface lava is seen too. The image was taken on 16 April 2008. Geological evidence from exposures of old surfaces on the south and west flanks of Mauna Loa led to the proposal that two ancient volcanic shields (named Ninole and Kulani) were all but buried by the younger Mauna Loa. Geologists now consider these "outcrops" to be part of the earlier building of Mauna Loa. 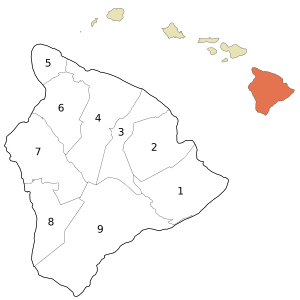 Hawaii County encompasses the entire island of Hawaii. Executive authority is vested in the mayor of Hawaii County, who is elected for a four-year term. Since 2004, the election by the voters has been on a non-partisan basis. In 2008, Billy Kenoi was elected mayor, succeeding Harry Kim who had served a two-term limit. Legislative authority is vested in a nine-member county council. Each member represents a geographical region of the island, which closely correlates to one of the nine tax map districts of Hawaiʻi County. Members of the county council are elected on a non-partisan basis to two-year terms, with elections occurring in November of even-numbered years. Saddle Road (aka the Daniel K. Inouye Memorial highway), passing between Mauna Loa and Mauna Kea). There are also State highways 270 ( Kawaihae – Hawi) and 180 (the " Kona coffee road", from Honalo to State highway 190), South Point Road (Highway 11 to South Point), etc. 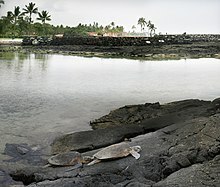 Green sea turtle lying on an old lava flow; the background shows a Hawaiian temple, known as a "heiau" in the Hawaiian language. Akaka Falls, one of the tallest waterfalls on the island. Amy B. H. Greenwell Ethnobotanical Garden houses many endangered endemic plants. ^ "Summit USGS 1977". NGS data sheet. U.S. National Geodetic Survey. Retrieved 18 August 2010. 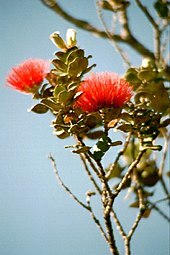 ^ "Hawaii Island Flower – Red Pua Lehua (ʻOhiʻa blossom)". statesymbolsusa.org. State Symbols USA. 31 July 2012. Archived from the original on 2 August 2012. Retrieved 3 August 2012. ^ "List of the Islands of Polynesia". Archived from the original on 1 January 2017. 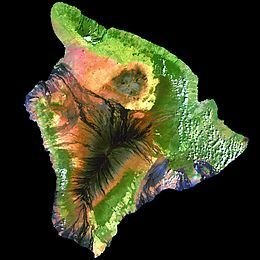 ^ According to the Geographic Names Information System, Island of Hawaiʻi is the preferred name, see U.S. Geological Survey Geographic Names Information System: Island of Hawaiʻi. ^ a b "State & County QuickFacts". United States Census Bureau. Archived from the original on 11 July 2011. Retrieved 28 June 2014. ^ Geography, US Census Bureau. "2010 Geographic Terms and Concepts – Place". www.census.gov. Archived from the original on 19 February 2014. ^ Jarves, James Jackson (1843). History of the Hawaiian or Sandwich Islands. Tappa et Dennet. p. 1. ^ "History – Captain James Cook". BBC. 1 January 1970. Archived from the original on 16 October 2014. Retrieved 8 August 2014. ^ Homans, Margaret; Munich, Adrienne. Remaking Queen Victoria. Cambridge University Press. p. 147. ISBN 978-0-521-57485-3. ^ "US Gazetteer files: 2010, 2000, and 1990". United States Census Bureau. 12 February 2011. Archived from the original on 12 March 2012. Retrieved 23 April 2011. ^ Delaware's Sussex County comes in second at 48.0 percent, while Rhode Island's Providence County is third at 39.6 percent. ^ "Table 5.08 – Land Area of Islands: 2000" (PDF). State of Hawaii Data Book. State of Hawaii. 2004. Archived (PDF) from the original on 29 February 2012. Retrieved 12 February 2010. ^ "Highest Mountain in the World". Archived from the original on 2 April 2016. Retrieved 4 April 2016. ^ "Frequently Asked Questions – Hawai'i Volcanoes National Park". www.nps.gov. U.S. National Park Service. Archived from the original on 6 August 2017. Retrieved 6 November 2017. ^ MacDonald, G. A.; Abbott, A. T. (1970). Volcanoes in the Sea. Honolulu: University of Hawaiʻi Press. ISBN 0-87022-495-6. ^ Moore, James G.; Clague, David A. (November 1992), "Volcano growth and evolution of the island of Hawaii" (PDF), Bulletin of the Geological Society of America, 104 (11): 1471–1484, doi: 10.1130/0016-7606(1992)104<1471:VGAEOT>2.3.CO;2 , p. 1471. ^ Garcia, Michael; Hanano, Diane (March 2008). "Age, geology, geophysics, and geochemistry of Mahukona Volcano, Hawai`i" (PDF). Bulletin of Volcanology. 74 (6): 1445–63. Bibcode: 2012BVol...74.1445G. doi: 10.1007/s00445-012-0602-4. Archived (PDF) from the original on 26 August 2015. Retrieved 14 December 2016. ^ "Loihi". www.volcanodiscovery.com. Retrieved 1 April 2019. ^ a b "Are We Breaking Away – The Great Crack" Archived 10 May 2009 at the Wayback Machine, USGS, 16 July 1998. ^ Owen, Susan; Segal, Paul; Freymueller, Jeff; et al. (1995). "Rapid Deformation of the South Flank of Kilauea Volcano, Hawaii". Science. 267 (5202): 1328–32. Bibcode: 1995Sci...267.1328O. doi: 10.1126/science.267.5202.1328. ^ Morgan, J. K.; Moore, G. F.; Clague, D. A. (2003). "Slope failure and volcanic spreading along the submarine south flank of Kilauea volcano, Hawaii". Journal of Geophysical Research. 108 (B9): 2415. Bibcode: 2003JGRB..108.2415M. doi: 10.1029/2003JB002411. ^ "Hawaiian Landslides – Slope failure on Kilauea's submarine south flank (Subsection)". Monterey Bay Aquarium Research Institute. Archived from the original on 27 May 2009. Retrieved 15 September 2009. ^ Pararas-Carayannis, George. "Hawaii – Earthquake and Tsunami of 29 November 1975 in the Hawaiian Islands". www.drgeorgepc.com. Archived from the original on 1 January 2017. ^ "April 1, 1946: Have we learned enough since tsunami that killed 159 in Hawai'i?". the.honoluluadvertiser.com. The Honolulu Advertiser | Hawaii's Newspaper. Archived from the original on 8 March 2016. ^ "King Kamehameha Hotel is new and improved after last year's tsunami". KHON2. Archived from the original on 8 January 2014. Retrieved 1 April 2012. ^ "Tsunami damage forces closing of Kona Village Resort". Archived from the original on 1 January 2017. ^ "Kilauea volcano in Hawaii could erupt after hundreds of small earthquakes". Retrieved 5 May 2018. ^ "Ige signs emergency proclamation following Leilani lava eruption". www.hawaiitribune-herald.com. Hawaii Tribune-Herald. Retrieved 5 May 2018. ^ "Overnight, earthquakes and lava become the new norm on Hawaii island". 3 May 2018. Retrieved 5 May 2018. ^ "M 6.9 – 16km SW of Leilani Estates, Hawaii". earthquake.usgs.gov. Retrieved 4 May 2018. ^ Armstrong, Jason (2 January 2019). "The VOG is Gone for the First Time in Decades". The Civil Beat. Retrieved 19 April 2019. ^ "Archived copy". Archived from the original on 27 May 2010. Retrieved 29 December 2009. CS1 maint: Archived copy as title ( link) on USGS web site. U.S. Geological Service. Retrieved 29 December 2009. ^ "Archived copy". Archived from the original on 5 February 2012. Retrieved 4 July 2015. CS1 maint: Archived copy as title ( link) on USGS web site. ^ "Archived copy". Archived from the original on 5 July 2015. Retrieved 4 July 2015. CS1 maint: Archived copy as title ( link) on "Airnow" US Government web site. ^ "Archived copy". Archived from the original on 22 February 2012. Retrieved 4 July 2015. CS1 maint: Archived copy as title ( link) on State of Hawaii Office of the Governor web site. ^ "U.S. Decennial Census". United States Census Bureau. Archived from the original on 12 May 2015. Retrieved 28 June 2014. ^ "Historical Census Browser". University of Virginia Library. Archived from the original on 16 August 2012. Retrieved 28 June 2014. ^ "Population of Counties by Decennial Census: 1900 to 1990". United States Census Bureau. Archived from the original on 6 August 2013. Retrieved 28 June 2014. ^ "Census 2000 PHC-T-4. Ranking Tables for Counties: 1990 and 2000" (PDF). United States Census Bureau. Retrieved 28 June 2014. ^ "American FactFinder". United States Census Bureau. Archived from the original on 11 September 2013. Retrieved 14 May 2011. ^ "Office of the Mayor". official web site. 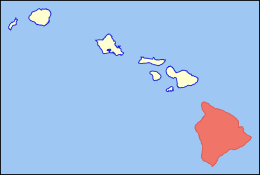 County of Hawaii. Archived from the original on 8 July 2011. Retrieved 27 March 2010. ^ "Ahupua`a". Hawaii History. Info Grafik. Retrieved 17 January 2018. ^ "Hawaiʻi County Council". official web site. Archived from the original on 8 July 2011. Retrieved 27 March 2010. ^ "Office of Liquor Control". Hawaii County web site. Archived from the original on 23 November 2010. Retrieved 25 December 2010. ^ " Kulani Correctional Facility Archived 13 August 2012 at the Wayback Machine." Hawaii Department of Public Safety. Retrieved on 30 September 2010. ^ " Closure of Kulani Saves $2.8M Annually; Facility to Help At-Risk Youth." Hawaii Department of Public Safety. July 2009. Retrieved on 30 September 2010. ^ Goldberg, Carey (9 August 1996). "As Sugar Fades Hawaii Seeks a New Cash Crop". New York Times. Retrieved 19 April 2019. ^ University of Hawaii Economic Research Organization (UHERO) (18 May 2012). "Economic Impact of the Natural Energy Laboratory Hawaii Authority Tenants on the State of Hawaii" (PDF). nelha.hawaii.gov. Honolulu, HI: University of Hawaii. Archived (PDF) from the original on 9 August 2014. Retrieved 7 August 2014. 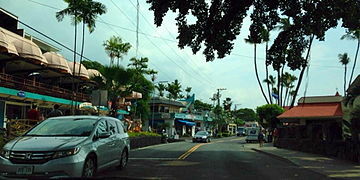 ^ "List of cruise ships that visit Kailua Kona". lovebigisland. Archived from the original on 2 January 2017. Retrieved 1 January 2017. 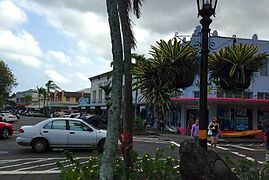 ^ "List of cruise ships that visit Hilo". lovebigisland. Archived from the original on 2 January 2017. Retrieved 1 January 2017. ^ "Hawaii: Image of the Day". 29 January 2014. Archived from the original on 10 January 2015. Retrieved 4 April 2016.